Book Review: The Perfect Match by Katie Fforde | An honest book review. Having read the blurb for Katie Fforde’s book, ‘The Perfect Match,’ I imagined it would be a light, fluffy, highly predictable read. Following on from her many previous successes, in February 2013 Katie Fforde’s novel ‘Recipe for Love’ won the Contemporary Romantic Fiction Award at the Romantic Novel of the Year awards for the second year running while simultaneously reaching No.1 in the bestselling paperback fiction chart. 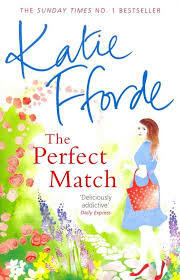 Katie Fforde’s ‘The Perfect Match’ has also attracted lots of positive attention being described as, “A wonderful warm-hearted escapist read” by Woman and Home; and “Romantic, warm and bursting with charm” by Woman’s Own. Bearing in mind the above, I have also read enough reviews on Amazon and Goodreads.com (to name a few) to know that Katie Fforde is a much-loved romantic novelist producing books which attract great comments and a majority of high ratings – in Goodreads.com this would be a four or five out of a maximum five stars. I give it three stars out of five. I have been an avid reader of Chick Lit/Romantic novels in the past, and am still a loyal follower of many of my old favourites such as Marian Keyes and Jane Green, but this was my first of Katie Fforde’s many novels. It was light, it was charming, it was romantic and I did enjoy it – but it wasn’t a page turner, I wasn’t anticipating every sneaky page I would read when I should have been doing something else, or longing to curl up on my own so I could lose myself in another life. My own taste needs something just a little more challenging to have me reaching for a novel every moment I can. The plot was a well-used and very predictable one; the heroine, Bella, runs away from the hero, Dominic, who she loves but who is already married, and starts a new life living with her godmother, Alice; the hero leaves his cheating wife, thus becoming available and goes to stay with a relative who (surprise, surprise) is a good friend of our heroine in her new town; Bella thinks Dominic hates her and there follow several ‘awkward’ and very coincidental meetings; and oh dear!, Bella also now has a boyfriend, Nevil; rather unfairly I feel, Nevil is revealed as the bad guy so that Bella can dump him without guilt – and then, oh look, Dominic loved Bella all along and they live happily ever after! There were no surprises in this romance. The highlight of the book for me was the gentler, more thoughtful romance that developed between Bella’s much older godmother, Alice and Michael, the gentleman she encounters by chance on the train. I personally found I was primarily waiting to see what would happen to Alice rather than Bella throughout the story. To summarise, it was a pleasant read and perhaps a nice follow on from a more challenging novel for a bit of light-hearted relief, but for me, that’s all it was – nice. I give ‘The Perfect Match’ three out of five stars.